Teddy Seyed, Xing-Dong Yang, and Daniel Vogel have teamed up to create a very interesting dual screen smartwatch concept which provides a variety of different options to be able to view content on your wrist. Check out the video and animated example of how the dual screens can be used together in a number of different combinations to provide the best ergonomic fit for the application you are using at any given time. The creators of Doppio explain more about the design and inspiration behind the smartwatch. 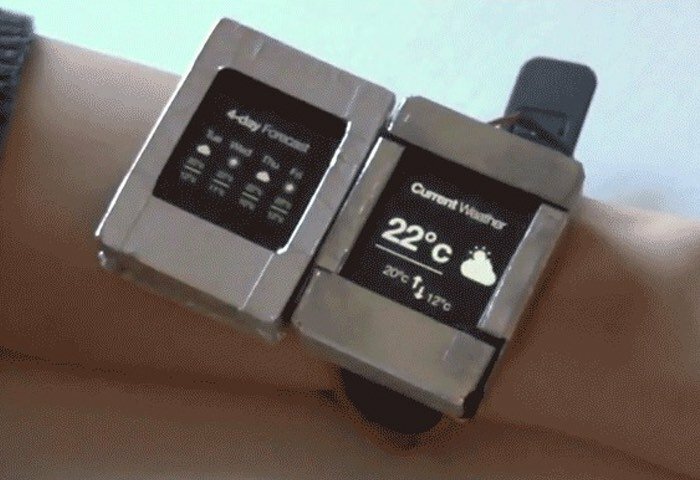 Doppio is a reconfigurable smartwatch with two touch sensitive display faces. The orientation of the top relative to the base and how the top is attached to the base, creates a very large interaction space. We define and enumerate possible configurations, transitions, and manipulations in this space. Using a passive prototype, we conduct an exploratory study to probe how people might use this style of smartwatch interaction. With an instrumented prototype, we conduct a controlled experiment to evaluate the transition times between configurations and subjective preferences. We use the combined results of these two studies to generate a set of characteristics and design considerations for applying this interaction space to smartwatch applications. These considerations are illustrated with a proof-of-concept hardware prototype demonstrating how Doppio interactions can be used for notifications, private viewing, task switching, temporary information access, application launching, application modes, input, and sharing the top. For more information on the new DIY smartwatch jump over to the ACM website for details following the link below.